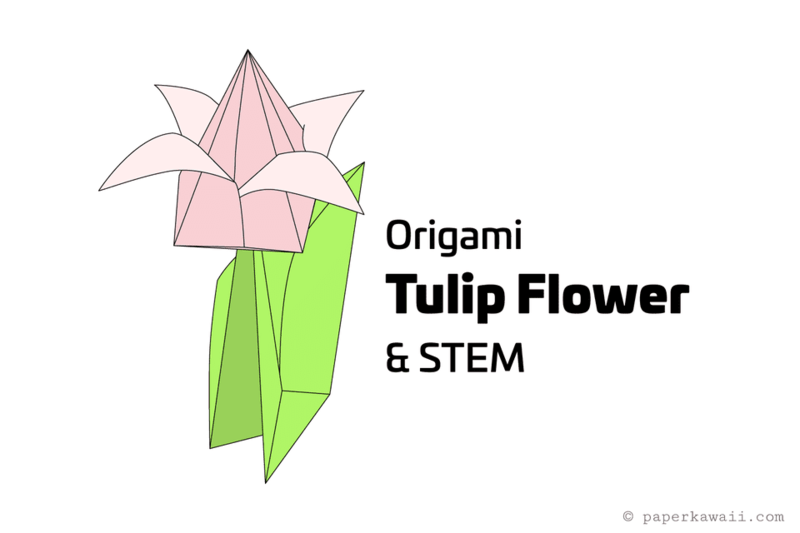 In this tutorial, you will learn how to make a pretty origami Tulip flower and a stem that it fits on! You will need 2 sheets of square paper for this one. This model is quite easy to make but has more steps than a beginner origami model. If you are just starting out with origami, you may want to start with something a bit easier, such as the easy origami tato envelope or this easy rectangular origami box. Start with your paper color side up. 1. Fold the paper in half, from left to right and unfold. Next, fold the paper in half, top to bottom and unfold. 2. Flip the paper over to the other side, fold the paper diagonally in half, in both directions and unfold. 3. Collapse the top down to the bottom, bringing the left and right edges in towards the middle. 4. This is how it should look, this is called an origami water bomb base. 5. Fold the bottom left and right corners up to the top point. 6. Flip the model over to the other side. 7. Fold the bottom left and right corners up to the top point. 8. This should be what you have. 9. Fold the right section over to the left. 10. Flip the model over, from left to right. 11. Again, fold the right section over to the left. 12. Next, fold the right edge of the front-most flap - just beyond the vertical crease. 13. Do the same on the left section. 14. Insert the left flap into the one underneath. 15. Flip the model over, from left to right and repeat the same steps on this side. 16. Fold the bottom section up and unfold. 17. Pick up the model and blow into the little hole at the bottom. You can shape the flower with your hands as it inflates. 18. This is the result. If the flaps come undone, it should be quite simple to put them back into place. 19. Carefully peel each petal downwards. 20. Keep peeling the petals until you have a desirable petal arrangement. 21. Start with the same size paper, this time, start with the white side facing up. Fold the paper in half diagonally and unfold. 22. Fold the left and right corners to the central crease, starting from the top point. 23. Next, fold the lower left and right edges to align with the central crease. 24. Again fold the left and right lower edges to align with the central crease. 25. Fold the bottom point up to the top. 26. Fold the model in half, left to right. 27. Carefully pull back on the bigger leaf, peeling it down like you did with the petals on the flower. 28. The stem is now finished, You can now pop the thinner stem into the bottom of the flower. You may need to play around with the fit, and use some glue if you need it to stay in place for a long time.